I found this recipe for apricot pork chops on Pinterest and they were really easy and fast to make. Just cook the pork chops in a skillet. After the pork chops have cooked, saute some onion and garlic in the skillet. Add some apricot preserves and a little bit of soy sauce. I served the pork chops with steamed sugar snap peas and wild rice. Delicious! I've made a chicken dish like this but never pork. 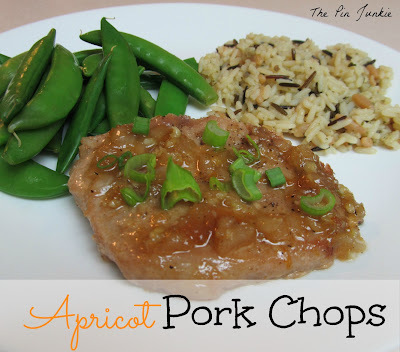 Pork sounds perfect for the sauce. Thanks for sharing your recipes with us on foodie friday. Great idea to use the sauce for chicken! I'll have to try that!